This is more about William (Bill) Harburn. There is a photo of the Crook Town team that won the Northern League Championship 1952-53 with Bill Harburn and Ken Williamson two local all-round sportsmen on it, it can be seen on the Northern League web-site, in the links it is Crook Town website and can be seen in the Clubs History. Other local players in the photos are Bill Jeffs, Frank Storr, Terry Turnbull, Don Heath and Eric Young. Bill Harburn in this photo won a mile long adult race in the river Tees at the age of fifteen years old. Bill Harburn, a goal scoring inside forward who came to prominence with South Bank in the immediate post war years after making a big impression scoring 129 goals in the all conquering South Bank junior side of 1942/43. A member of the clubs Northern League Challenge Cup winning side of 1948, he appeared in league football as an amateur with Darlington, he also played for Crook Town where he won a Northern League Championship winning medal in 1952 and Bishop Auckland. He then emigrated to Australia where he played for them in the 1956 Olympics before he was killed in a fall from a bridge which collapsed whilst he was working as a steel erector. SOME OF THE CRICKETERS AT TEASDALE WORKS, HEAD WRIGHTSONS, THORNABY WERE DOUGIE MERRYWEATHER, TERRY McCABE, JOHN KIRK, BENNY CROSS, PETER RANDELL & NEIL MARSDEN. JIM ORPEN PLAYED FOR NORTON. SOME OF THE OTHER FOOTBALL REFEREES APART FROM PAT PARTRIDGE, ALEC BROWN, ARNOLD WELLS & FRED WATSON WERE LENNY NICHOLSON(FITTING SHOP) WHO OFFICIATED IN THE FOOTBALL LEAGUE AND WAS ON THE LIST OF THE ALLIANCE PREMIER LEAGUE OFFICIALS (NOW THE BLUE SQUARE PREMIER LEAGUE) & JOHN KIRK(BRIDGEYARD), BRIAN HOWAT(FITTING SHOP) & TERRY LAING(OFFICES) WERE ON THE NORTHERN LEAGUE LIST, THEY ALL WERE FOOTBALLERS WHO STARTED REFEREEING IN THEIR EARLY THIRTIES. Tommy Reece was a Millwright (maintenance fitter) & worked in the maintenance shop along with Ebby Neil, Stephen Smailes, a guy called Morton who was a member of the Magic Circle & an old fitter called Fred, a smashing chap. Along with the top cricketers at Teasdale works, Benny, Head Wrightsons could have turned a top North Yorkshire & South Durham League team out. No wonder the Inter Departmental cricket & football competitions were hard to win in those days. Talking about the gentle giant Tommy Reece, Len I remember playing with Tommy as a seventeen year old at South Bank, and stripping off for the hot ‘after match’ bath for the first time alongside Tommy. Tommy saw me staring at him, a fine figure of a man, big in all aspect both bodily and personality, Tom said to me, ‘Its the cold weather Benny, it always shrivels up like that’. Tommy was my protector on the field and looked after me when the big boys were after me, he was a lovely man, and a very good footballer. The last time I saw him was in his local at the Rimswell Fairfield many years ago. I think he may have passed away shortly after this meeting. Tommy was a first class Wheelwright at Stockton Forge, which was a works that spawned many top footballers and cricketers. Cricketers including Dickie Spooner, Alan Townsend, Gus Williamson, Harry Thompson, Norman Toulson, Billy Robson Stockton wicket keeper, Colin Richards, and there must be some I did not mention., and at one period could field a Inter Departmental Cricket Team all with North York’s and South Durham credentials. Gran Cooper was also apprenticed there as I was myself. Harry Wilson the well known Top line referee was also in the Template shop. I have received an article from todays Australian newspaper referring to the accident on Melbournes West Gate Bridge, 40 years ago today, in which Bill Harburn was one of the 35 workers who tragically lost their lives. The article describes what went wrong and comments from a survivor, and a family involved. Should anyone wish to see this article, I would be happy to endeavour to pass it on. The late Bob Harburn who I knew well was a big pal of Bob Wallace and Norman Toulson, they were all good darts players and of course worked at Stockton Forge, where Benny Brown and I served our time. When Bill Harburn captained Australia in the Olympic Games in Melbourne 1956 at football there was a photo in the Evening Gazette of Bill shaking hands with Bob Hardisty, the Great Britain captain, & it said ‘two old Bishop Auckland colleagues & now rivals’. Stephen your older brother Bill with his wife & baby son came to visit us in the early eighties, I gave him some help with the family history. I am Bill Harburns youngest son Stephen. I have a few photos that may prove interesting to some of the people that knew my dad. I will submit them to this site. Some of your comments have put a new perspective on a lot of the photos I have. What an amazing world we live in. Thank you for sharing you kind thoughts and memories of my dad. My mother Mavis is still alive and living in far North Queensland. Stephen, did you forward your photos to the picturestockton website? Because quite a few of us would be interested. What did you have to do to win the Greenwood Shield & Snowdon Cup – were they freestyle, backstroke or breaststroke & over what distance? Hello, I am Stan Rickaby”s grandson. He is indeed alive and well in Perth, Australia but I daresay he”s not very computer literate. I will let him know of this site. Hello, my dad George Poulter 91 is reading Stan’s book he is so pleased as it is bringing up loads of memories he had forgotten. He remembers meeting Stan in the Durhams, he also went to see him play in 1950. My dad is not a reader but this book has been great. Bill Harburn, John French and Len Franklin are all referred to in Stan Rickaby”s book “Stan Rickaby – Upover and Downunder”. They played football for Eamont Road Club in the Minor Section of the Stockton & District Junior League. When the 2nd World War started the Stockton Junior League closed down for the time. Eamont Road Club”s officials came up with the idea of forming as “Middlesbrough Crusaders” and were made members of the Middlesbrough Junior League for the 1940-41 season, although they were actually still younger than 16-18. A great season including beating South Bank Juniors at South Bank. For the next season South Bank “poached” Harburn, French, Franklin, Rickaby and Bill McLean. 36 won out of 37 in a very good league. Bill McLean taught at St Bede”s I recall. So there was a strong Stockton element at South Bank before the Benny Brown, Bill Rosser et al period! Stan Rickaby often walked from his home in Norton to play for South Bank Juniors at their Normanby Road ground, South Bank. Stockton lads who played in that area in the fifties had to get two or three buses to get to the ground, that is what you had to do to play for the top junior team in the area. Stan Rickaby now lives in Perth Western Australia, it would be intersting to hear from Stan if he reads this site. If the Rickaby is Stan Rickaby then he went to Holy Trinty and Stockton Grammar School. His book, on my bookshelf, is fascinating. Bill(BANT)Harburn as well as being a champion swimmer & excellent at football,he was also a good boxer.When Bill played for South Bank Juniors,the South Bank Community produced players such as Hardwick,Mannion,Franklin,French and Rickaby. I wonder whatever happened to the trophies and shields, such as featured in this photograph, that schools competed for in the area swimming galas. Likewise the Salter and Salmon cups for the local schoolboy football teams, the finals being played out at the old Stockton Victoria ground. Are they still in existence? The player”s name I mentioned previously is actually Jimmy Nimmins, he was injured against Crook Town in the F.A.Amatuer Cup Final at Wembley,1954. The names you mention Len bring back memories of 50 odd years ago, you mention Hardisty and Niven who was actually called Nimmo, I remember playing against this International Duo as a seventeen years old inexperienced youth for South Bank, alongside Bill Harburn and the gentle Giant Tommy Reese. I made the mistake of slipping the ball through Jimmy Nimmo.s legs and making him look a little foolish, soon after he came up to me and out of the side of his mouth he growled do that again sonny and I will break both your @#$%@#$ legs, needless to say I kept my distance from him thereafter, but did manage to sustain a serious Knee injury which troubled me ever after until I had a complete Knee replacement with a Titanium Knee three years ago. On Mentioning this incident to my good Friend Jimmy McMillen of Crook Town and England, fame who holds the record for the most Amateur Cup winners medals at four, he said Nimmo had done the same to him the first time he played against him. Wonderful memories of yesteryear..
Benny I remember my father taking me to see Bill swim in the Yarm river race,also at Seaton Carew when they dived off the side of a big boat at the Hartlepool end of the beach & raced in the sea. Another time we went with Bill in Ken Williamson”s car, when they both played for Bishop Auckland,in the days of Bob Hardisty & Jimmy Niven. Ken was another great all round sportsman. I was a Head Wrightson”s Teasdale man,but when I was in the Apprentice School, Iworked at the Forge with the gentle giant Tot Reece. Len I knew your cousin Bill Harburn very well, I played football with him at South Bank in the Northern League when I was seventeen years old, and I was also his apprentice at Head Wrightsons Stockton Forge, just before he emigrated to Australia. As you will Know Bill was tragically killed when the Bridge in Melbourne collapsed killing 39 construction workers in 1970. Bill was a great footballer and represented Australia in the 1956 Olympic Games in Melbourne. I arrived in Australia just after the accident and was going to meet up with Bill in Melbourne, so it was a great shock to me. I also Knew Bills younger brother Robert who also died very young, and his brother Albert who worked at Stockton Forge . 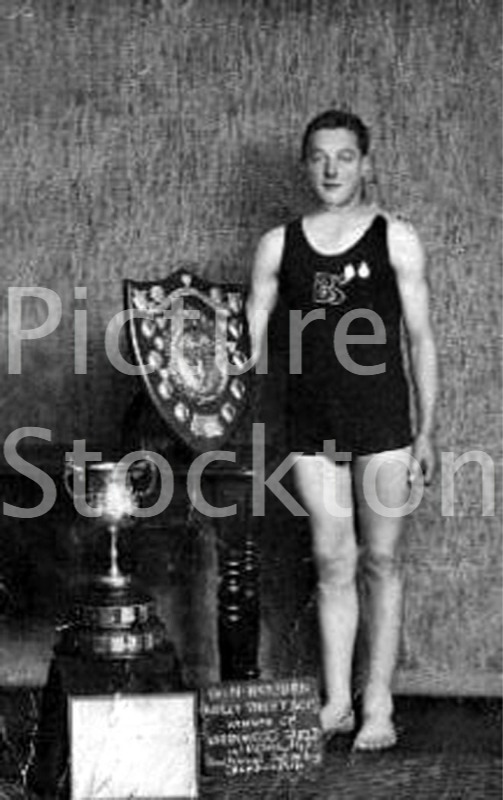 This is my cousin Bill Harburn with the Greenwood Shield & Snowdon Cup in 1937, he swam for Bailey Street Boys and he lived in Buxton Street, Portrack. He was a well known Northern League footballer who played for South Bank, Bishop Auckland and Billingham Synthonia, before he emigrated to Australia.